I’m playing with the Common Core Standards in attempt to try and find ways to represent those standards which relate to technology to the rest of the standards as a whole. My ultimate goal is to try and find a way to emphasize the presence and requirement of student use of technological tools and methods of communication within the Common Core, without trying to isolate them as yet another “add on”. I’m not sure if this visualization is helping. 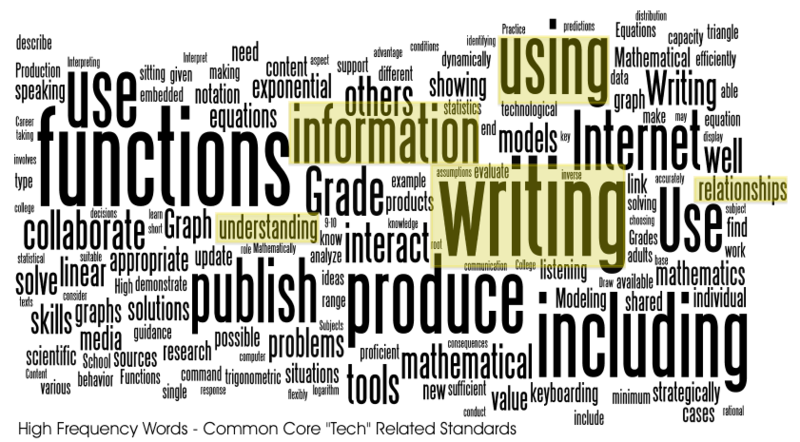 In the interest of full disclosure, the top image is a collection of high frequency words from any and all language in the Common Core documents with the term “technology”. The bottom image a collection of high frequency words from all of the language from both the ELA, History, Science, and Technical Subjects Standards and the Math Standards. In fairness I removed the words “student(s), number(s), standard(s), and e.g.” from both sets of words as they were very high frequency words with little impact on the comparison. I also removed the word “technology” from the top image so it wouldn’t stick out so much. Am I missing something that I haven’t already highlighted, or am I manipulating this data too much to the point of uselessness? high frequency words from all of the Common Core language that references using "technology"
I haven’t even begun to think about thinking about Common Core, although I should, I know. But just glancing at these infographics…is it bad that “understanding” (lowest level of Bloom’s taxonomy) is prominent in each? Just wondering. There are a lot of school districts that are waiting around for assessments before they start seriously talking about it, IMO that is. I think it’s of value for all teachers to really start exploring the Common Core, because there’s a HUGE amount of value in the process standards and the College and Career Readiness Standards, which are poised to finally be just as important as the content standards. The fact that “understanding” is so prominent is actually a good sign from my viewpoint. Far too much of school district’s curriculum is prescriptive, and quite often doesn’t allow for students to demonstrate understanding. That having been said, there are a lot of high frequency words I didn’t highlight that might be better suited for tackling Bloom’s taxonomy; determine, collaborate, analysis, speaking, etc. As I delve into the Common Core Standards as they pertain to the non-English(the science, history, technology, computer science, etc…)classroom, I have been searching text-based resources extensively. What a pleasant surprise to find these images that you created! Delightful, new perspective, opportunity to reflect, thank you! As a CS teacher…I love “use functions” in their close proximity to each other, as well as, “publish” and “produce”. I didn’t even notice the “use function” until you pointed it out, nice find! That’s what I love about collaborating on something visual like this, different eyes searching for different pieces in the puzzle! I wish “publish” and “produce” had figured in more prominently in the ELA standards to help support their high use in the tech based standards, but I love that “relationships” and “understanding” came up high in both. I really like this!! I am a visual person and trying to sift through all the information has been a drain on my brain. As our district begins this long-term journey, it’s nice to have this to look at to really help me process the information!!! I am a graduate student in education, and my professor recently introduced our class to using “word clouds”. The class happens to be an educational technology class and as a group we were asked to define in our own words what educational technology means to us. She took our responses and did a similar word cloud to the ones above. I was amazed about how much we concluded and learned from the picture. We raised additional questions just as the above responders raised. Our class activity was simply our own opinions, and I knew this sort of word cloud would be very useful for other activities; however I didn’t even think to apply it to common core standards! The visual that this provides is amazing. The common core is where the future of education is going and after closely looking at the high frequency words that are related to technology, they are mostly verbs. This just proves how important technology is in education and that as teachers, we need to prepare our students for the future. I plan on creating a visual similar to this to have in my elementary classroom. Or rather, does it show us just how unimportant technology will become, and instead is an attempt to refocus education on process, deep understanding, and creativity, and technology is just one vessel in which to carry that learning? It seems as though education just goes in circles and the focus is shifting every few years. If technology brings back the deep understanding and creativity that I remember learning being about when I was in grade school, then let’s continue that trend, and stick with it. My students lack the ability to think critically and use creativity and I would love to see a shift toward bringing that back. Technology has to be used in the proper way also, as a tool for learning. Not just to make things appear easier. 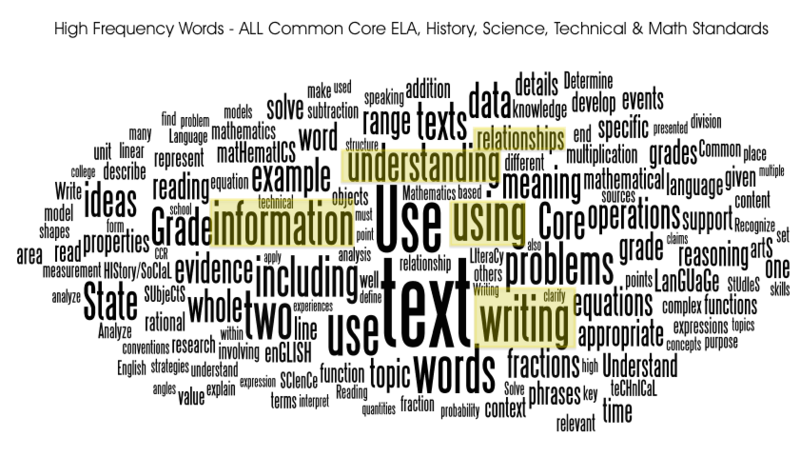 As a visual learner, I love the word clouds you created based on Common Core language. I definitely plan to share these with my faculty (crediting you, of course) in a presentation I am giving about the CCSS. Rock on! Use them and share them with others!